Home > Nightstand > Is This Still On? I keep thinking of checking in to tell you about books I’ve read, bought, etc. but life just seems to be flying by and the longer I keep away from the blog the harder it is to come back because I feel a bit overwhelmed by where to start. Anyway, I hope you’ve all been doing great and forgive me for the extended silence. What’s been keeping me from the blog? Work has been a bit busy and changes are happening so more than likely I’ll be looking for a new job in the next few months. I have been trying to focus on my health a bit more after a doctor visit so more time at the gym and walking outdoors – which actually has led to me enjoying audiobooks a bit more! Now if I could just find the time to do yoga again. When not reading I’ve been spending more time with my mom, in our garden and of course crafting. 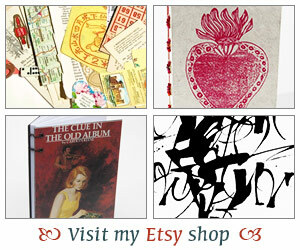 My Etsy shop is not closed but my focus isn’t on it at the moment. Right now when I craft I just make stuff for me and that makes me happy. 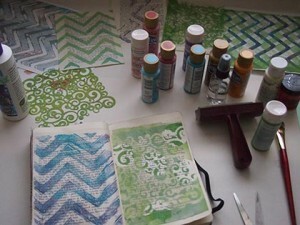 Look at what I’m into lately – monoprinting! I got a gelli plate and have been busy getting paint everywhere. I tell you, one of these days I will take a real printmaking class. This is just too much fun. I celebrated a birthday recently and my dear husband got me some craft supplies. Lots of stuff he said he didn’t know what it was for but figured I would and he was right. What a good husband. So more crafting adventures to come. Anyway, that’s a quick recap of life at Casa Bookgirl. My posting will more than likely be a bit spotty in the next couple of months as we have vacation coming up, family visiting, etc. but I will try to pop in. I actually have a new stack of books I need to tell you about so hopefully I can get another post done soon. Anyway, I hope all is well with you all and hope you’ve been reading lots of great books! Don’t worry! Take your time! I love that you are crafting a lot. Would you maybe do a regular posting on different kinds of crafts and good links or resources for each? Or maybe you already have a post like that.. I love crafting in general, but I really only knit. Sometimes you just need to take time out for yourself. I am glad you are able to do that. Don’t worry about us. I am sorry to hear things at work are up in the air. I have been putting in extra hours whenever I can, trying to build my time up for surgery later this fall. I had thought I would need to go out sooner, but the doctor says it’s okay to wait a little longer. Whew! That’s one weight off my back–at least partially. I’m not at all excited about the prospect of surgery, as you can imagine. I hope you have a wonderful vacation and visit with your family, Iliana! We’ll wait for you. Yay! for husband’s who give craft supplies! Happy Birthday! Happy Birthday! We’ll be here when you have time to write. I rarely post to my blog anymore but did start a book tube channel on You Tube. I have found it easier to speak my reviews than to write them. I love that your husband just bought you things because he knew you’d know what to do with them! Finding balance is so hard in this life…. right now is my time off, as I’m a teacher. Here’s where I try to recover from all the damage I’ve inflicted on my poor body over the school year. Back to the gym, and walking, are both on my agenda too. Let’s hope both of us get better at self-care. I’m glad you’re still here, I always like to read about what you’ve been up to! 🙂 The monoprinting looks really fun. I got into making stuff in the past few months too, though not book stuff like you. I’m learning to art journal though, which is really fun! No worries, Iliana! We’re always here. 🙂 And, we need some time off for ourselves at some time so I totally understand.